The projects listed below demonstrate the broad breadth of our capability in transport planning. TPP have worked closely with AEG at The O2 since 2006. Prior to its opening in 2007, TPP developed the Travel Plan for The O2 on behalf of AEG. This Travel Plan is held up as an ‘exemplar’ document by TfL to demonstrate best practice. We devised a comprehensive highway signage strategy for The O2 site, and have undertaken design work in relation to both the internal layout of the arena site and the external car parks. We also undertake ad-hoc traffic management measures for special arena events such as The Brits Awards. 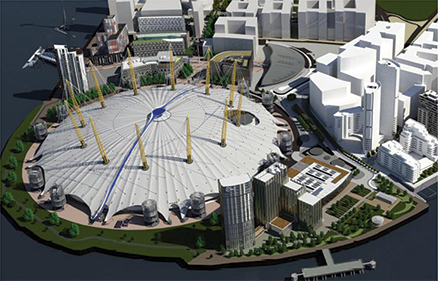 Also acting on behalf of AEG, TPP prepared the Transport Assessment for the consented 450 bedroom hotel and 100 serviced apartments alongside The O2, including a ballroom for major corporate events, a restaurant and health spa. We have also helped secure consents for a 18,659m² office development, a 25,000m² Factory Outlet Village within the tent and the “Up at The O2” walkway over the top of the tent, all on behalf of AEG.